2016 was another reminder that rights and equal treatment under the law doesn’t easily apply to Blacks. CHICAGO (FinalCall.com)—Each year has its own unique footprint that leaves an indelible mark on history. For Black people, 2016 could be seen as a year of change, and in many respects, an awakening in politics, economics, health and culture. Between the continued assault on Black bodies by police and the racially, politically charged 2016 presidential election cycle, Blacks were reminded that they are collectively still in pursuit of freedom, justice and equality in America. However, this realization did have a positive effect: it reignited the importance of Blacks rallying around one another and doing for self. It is a reality that Dr. Ron Daniels said is very concerning. “That’s an ongoing epidemic on two fronts that’s very troubling,” said Dr. Daniels, president of Institute of the Black World which convenes a State of the Black World Conference. He told The Final Call he was encouraged by the work of young activists confronting issues through targeted demonstrations and protests. As of Dec. 23 of this year, 940 people have been shot and killed by police in the United States. Of this number, 226—24 percent—of the victims were Black men. While a large majority of these shootings went ignored by the national media, quite a few became high-profile, controversial cases. Police shootings of Philando Castile, 32, near Minneapolis; Alton Sterling, 37, in Baton Rouge, La. ; Tyre King, 13 in Columbus, Ohio; Keith Lamont Scott, 43, in Charlotte, N.C.; Terrence Crutcher, 40 in Tulsa, Oklahoma and Korryn Gaines, 23, in Randallstown, Maryland were just a few of the high profile cases in 2016. Many of the shootings sparked outrage with street protests, targeted economic boycotts of retail establishments and in some cases uprisings that resulted in violence. This year was another reminder that rights of citizenship and equal treatment under the law doesn’t easily apply to Blacks. A good example of this are the few number of criminal charges filed, prosecutions, trials or convictions in the shooting deaths of Black Americans. 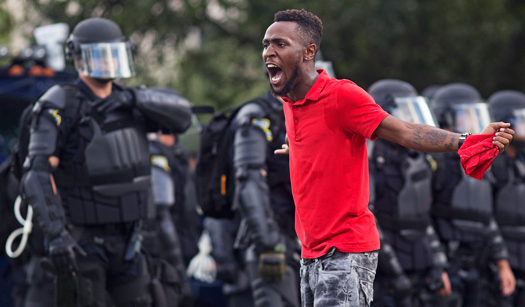 A protester yells at police in front of the Baton Rouge Police Department headquarters after police arrived in riot gear to clear protesters from the street in Baton Rouge, La., July 9. Several protesters were arrested. Additionally, although being publicly disputed by law enforcement agencies and police supporters, the American Journal of Public Health confirmed what many in the Black community have known and said for decades. The journal found that Black men—as well as American Indians and indigenous Alaskans—are three times more likely to die at the hands of police. Hispanic men are twice as likely to lose their lives as the result of police encounters than White men. Black women are not exempt. What started in early August by Baltimore County Police, as another day serving arrest warrants for failure to appear in court, ended in the shooting death of Korryn Gaines, and the shooting of her five-year-old son. According to reports, Ms. Gaines was holding her legally obtained Mossberg, 12-gauge shotgun and was shot to death after a standoff with police. No charges were filed against the officers. Women: Do you know the science of food? Are you "too busy" to cook?